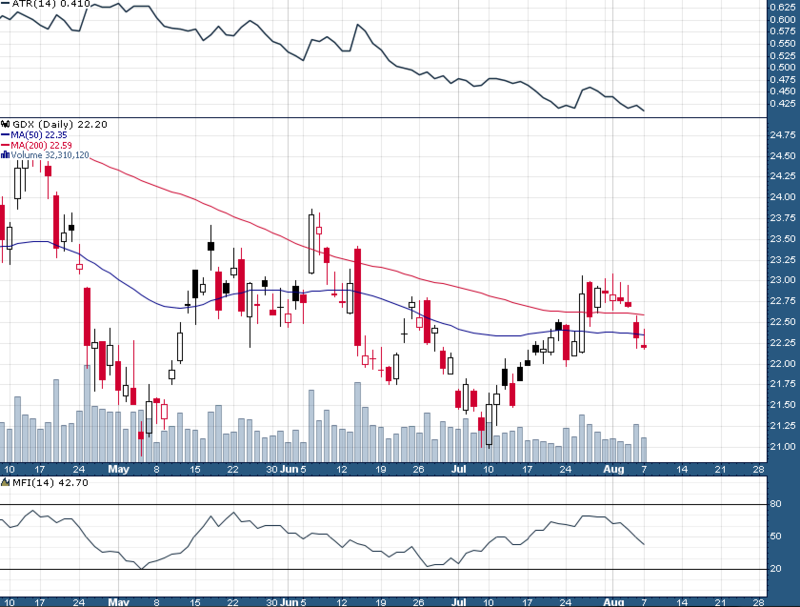 Gold Miners Set For Big Move After Record Period of Calm | Energy and Gold Ltd. The answer is never. The last time GDXJ fell for six consecutive trading days in a similar low volatility fashion was February 2013 (-5.8%), which turned into a 12 session losing streak and eventually a complete obliteration over the next few months (-40%+ between the beginning of February and the May 2013 low). It’s also worth noting that the GVZ (Gold Volatility Index) is plumbing near record low depths after dipping below 10, albeit briefly, in June. While the current ultra-low volatility environment is significant in itself, the fact that it is occurring within the context of a multi-month symmetrical triangle, which is nearing its apex, adds extra significance. 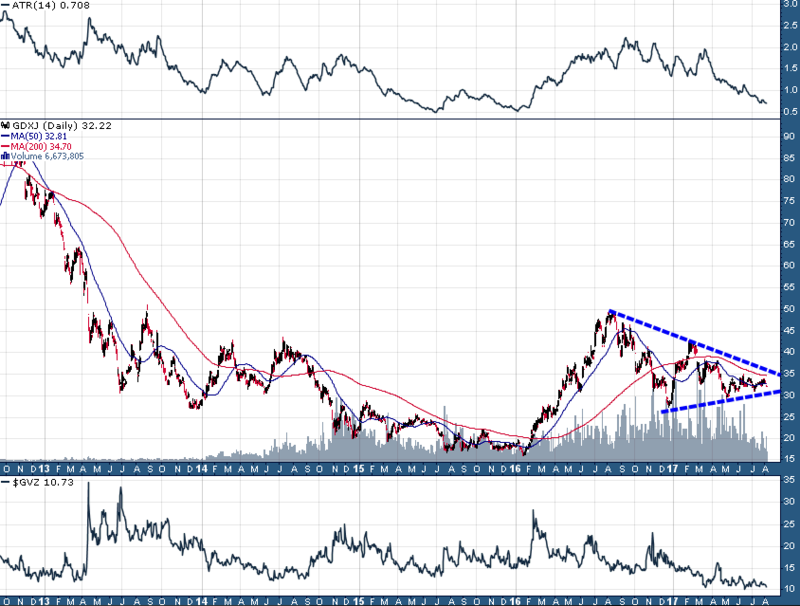 Considering that late-August and September have a tendency to see a spike in volatility across asset classes, including precious metals, I believe there is a good probability that we will see a resolution to the triangles in the gold miners during the next 4-6 weeks. Moreover, this resolution could result in a powerful directional move simply due to the sheer amount of potential energy which has built up during the last few months. My inclination is that this resolution will occur sooner rather than later. 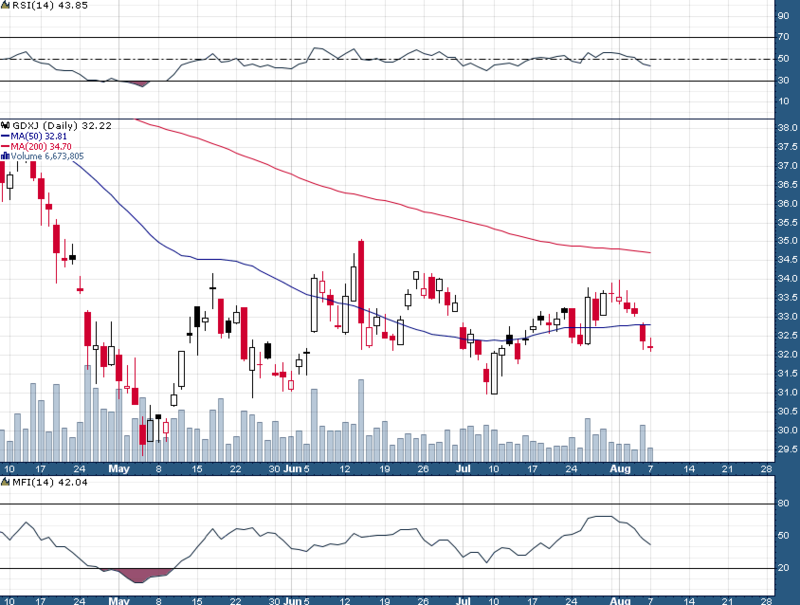 The $23 resistance and $21 support levels in GDX will be crucial to keep an eye on over the coming weeks. To find out how I am trading the GDXJ as well as precious metals and individual mining shares you can subscribe to the Trading Lab today!